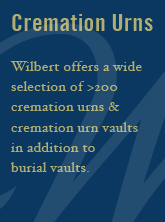 Leading funeral directors across the United States and Canada recommend Wilbert burial vaults and cremation urns for their precise engineering, elegant designs, and accompanying service. 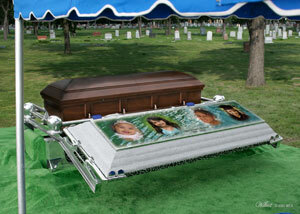 Families choose Wilbert burial vaultsover all other brands for the peace of mind provided by their unequaled construction and appeal. High-quality structural concrete establishes our vaults' strength. Bonded interior liners of high-impact thermoformed plastics such as ABS Marbelon™, ABS Trilon®, or a Unidex® two-part epoxy system supply additional durability. Interior linings of stainless steel, copper, or bronze add extra resilience—and a touch of beauty. A wealth of available resources will help you through the loss of a loved one and the arrangements that follow. For additional information, you may find the burial and cremationsites below useful.